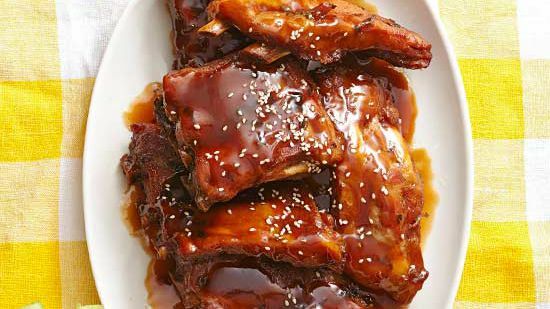 Barbecue pork ribs are usually made on the grill, but baking ribs in the oven gives this recipe its signature fall-off-the-bone tender results. In a medium saucepan, combine the soy sauce, water, 1/2 cup brown sugar, molasses, and salt. Bring the marinade to a boil; set aside to cool. 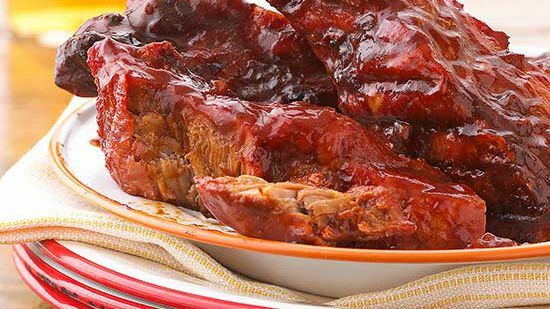 Put the ribs in a large, turkey-size oven baking bag or sealable plastic bag. Support the bag in a 12x14-inch baking pan. Pour marinade over the ribs and seal the bag. Marinate in the refrigerator overnight, turning the bag occasionally to thoroughly coat the meat. Drain and discard the marinade from the bag. Cut 4 slits in the top of the baking bag if you are using one. Otherwise, drain the marinade, transfer the ribs to the baking pan, and cover the pan with foil. 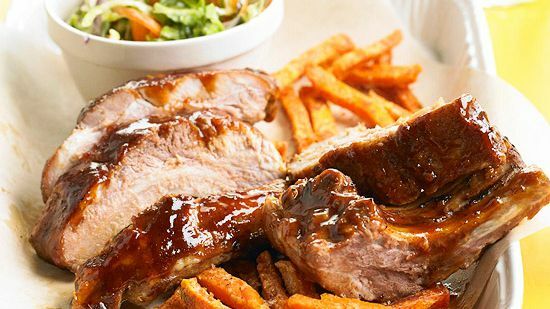 Bake the ribs for 2 hours. 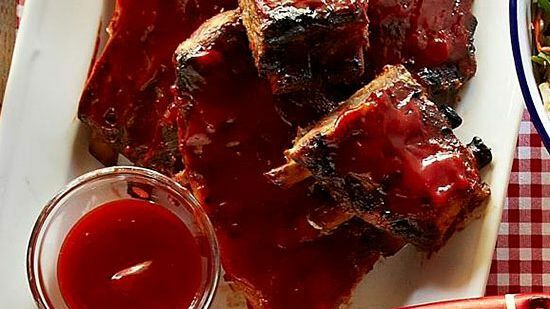 While the ribs are baking, prepare the barbecue sauce. In a large saucepan, blend the water, ketchup, chili sauce, 1/2 cup brown sugar, and dry mustard. Bring this mixture to a boil. Stir well to dissolve the sugar; set aside to cool. 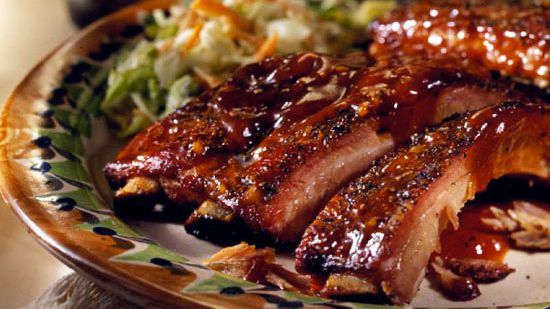 When the ribs are cooked and tender, open the bag or remove the foil and discard the drippings. Lower the oven temperature to 350°F. 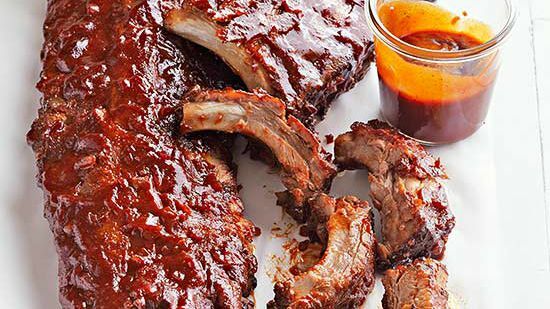 Brush the ribs on both sides with the barbecue sauce and return them to the oven to bake, uncovered, for 30 minutes longer. 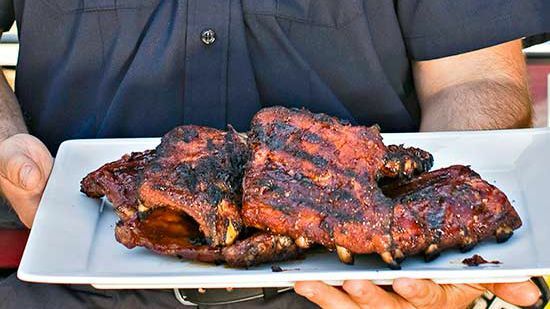 Just before serving, throw the ribs onto the barbecue or blacken them under the broiler to give them a bit of a char. 401 calories, (8 g saturated fat, 4 g polyunsaturated fat, 9 g monounsaturated fat), 97 mg cholesterol, 1099 mg sodium, 23 g carbohydrates, 0 g fiber, 20 g sugar, 28 g protein.